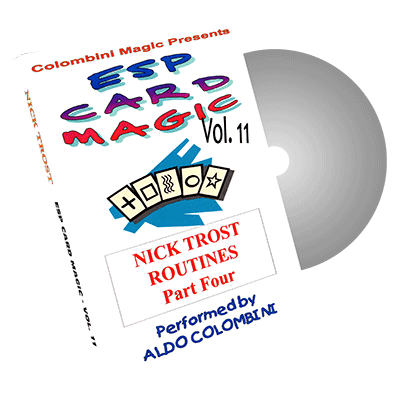 Today, when you order "ESP Card Magic (Nick Trost) Vol. 11 by Aldo Colombini", you'll instantly be emailed a Penguin Magic gift certificate. You can spend it on anything you like at Penguin, just like cash. Just complete your order as normal, and within seconds you'll get an email with your gift certificate. THIS IS THE ELEVENTH IN A SERIES OF DVDS DEDICATED TO TRICKS AND ROUTINES USING ESP CARDS. 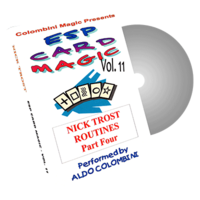 NICK TROST HAS CREATED DOZENS OF ESP CARD ROUTINES. CHECK THE PREVIOUS THREE TROST DVDS. THE THIRD DIMENSION: In this triple-barreled test, you discover three thought-of symbols in a baffling manner! SYM-SATIONAL: Three spectators each peek at a symbol. The performer reads their minds and names each symbol! MILLION TO ONE ESP: One of the strongest routines with ESP cards. Five spectators each select five face-down cards apiece. At the end they find out they have selected one each of the five symbols! SYMBOL DISCERNMENT: In spite of not seeing the cards, you reveal how many of the spectator's selected symbols have been dealt and you are able to detect if a packet contains a special "card!" ESP SIXTH-THOT: You remove a symbol and place it in your pocket. From a set of five symbols a spectator mentally selects one. This card matches your prediction! DREAM OF THE HERMIT: An incredible series of coincidences between cards selected from both you and a spectator. Great routine! METAPHYSICS UPDATED: Two spectators select a card each and you are able to find the matching symbols! TRIPLE PSYCHOMETRY: A beautiful routine involving several effects, where you reveal selected cards and these cards find the matching symbols. A must for every ESP lover! ULTRA-DIE PROPHECY: You place a prediction on the table. A spectator throws three dice and the total reach a card at random in the deck. This symbol matches your prediction! ESP 7-CARD DRAW: A prediction is left in full view. The deck is shuffled and a spectator draws seven cards. They match the symbols you wrote on the prediction!